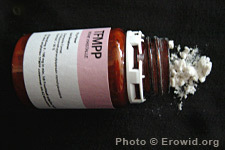 TFMPP is a synthetic piperazine most commonly combined with BZP. This combination has gained popularity in some countries as a legal alternative to other stimulants. TFMPPs effects alone are not well known.